One mistake I made since the last blog was that I had said I was using the Twenty Ten theme, I was wrong… in the process of changing it I realised I was actually using the Twenty Eleven theme, there really wasn’t any obvious evidence of it (except for the footer). Well I’ll live with it. 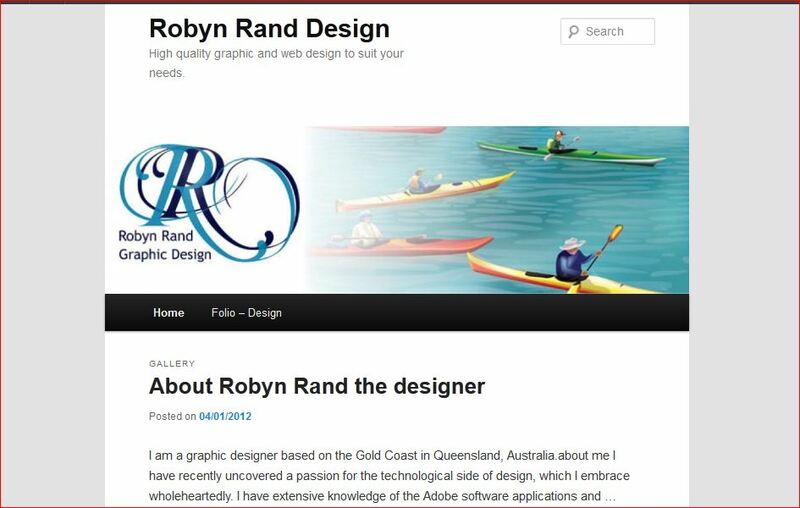 I have developed a few other changes and began by changing my home page – which I think was my front page, I changed the picture which was just a matter of going into the appearance and changing the header picture, I just stuck my logo onto the picture in photoshop, saved it as a jpeg and loaded it as an image. Then I went into the text and changed it into stuff about me. I left the thumbnails in the middle of the page because it works for me and I also had a couple of choices about where to let the images open, I chose the new page option and am happy with that choice at the moment although if I want to change it, as I may when I have larger issues sorted it seems simple enough. 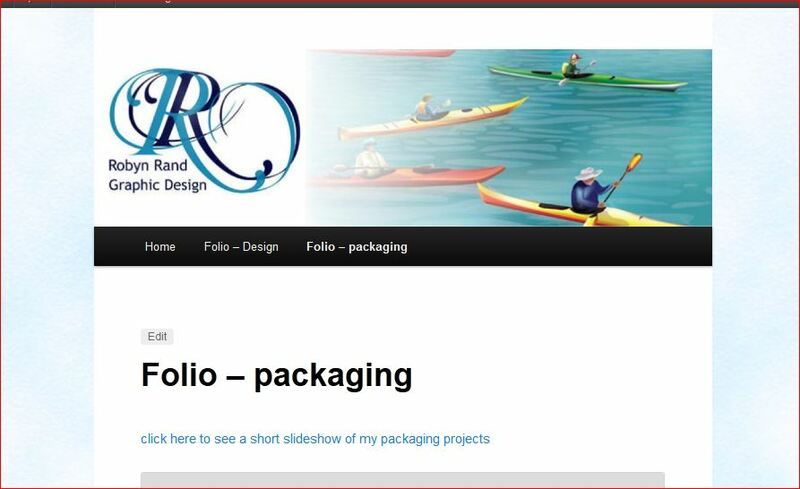 Next I added a swf file I had made showing photos of my packaging projects – this was important to me as I need to be able to display swf files, I had a few problems with it opening without getting a 404, after uploading and deleting it a few times it finally worked, I’m not sure if it was the file, the size or maybe a problem with our internet at the time as it jumps in and out occasionally. I do realise I could of inserted it as a gallery/slideshow thing from WordPress but I did want to be able to construct the swf first then place it, I’m glad I persevered. Next I want to add a contact me page, also some way to display all my awards and certificates etc which I would like to do in a different style but haven’t thought of yet. For the moment I’m having a couple of days off because my mum is visiting. I have downloaded the WordPress download from my host and it was a simple as I suspected, just one click – if it’s any more trouble then that your host is not helping you enough. Of course there were a couple of questions & I had to password it but over all it was oh so simple! I have decided to stay with the plainest theme so I can put more work into it myself and chose the default (Twenty ten). Now the tricky bit starts, making it my own – hopefully I can understand it and will be good at altering it. I have decided to take a few screen shots of it along the way so you will have a little appreciation for the small changes I make & I will be explaining the process as I progress. If I understand what I’ve done, the opening shot of just the Twenty Ten theme was a little boring – anyone can get that so I thought I would make the first screen shot of the page 1 with change number 1 – the name. I found a host, not telling who just in case they are really bad, but they seem pretty good if you can believe all the good things they have to say about themselves. I got me a new domain name too, I’m not sure if I needed to get a new one as the other one still has a few months to go on it I thought I might as well, it was a part of the deal anyhow. 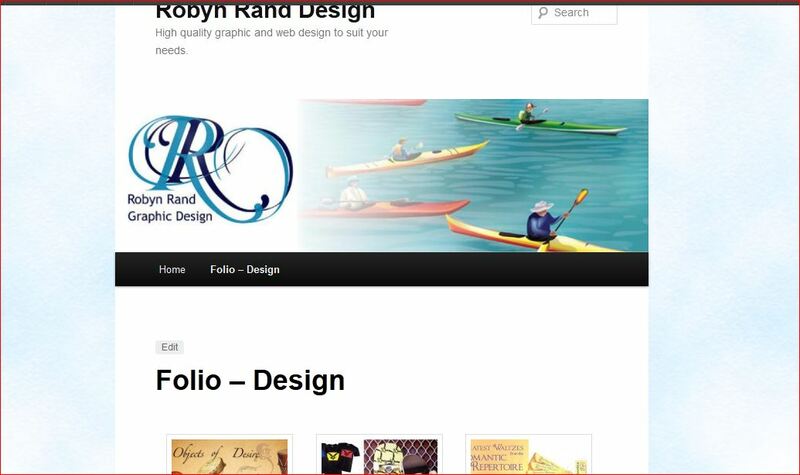 So now I’m RobynRandDesign.com I just have to go around & change all the links I have to myself, and I hope anyone else who has links to me changes too. I’m not quite sure what to do next, I have a lot of help pages and beginner tutorials to watch & read before I start anything. I have to get my account verified before it will let me do anything so I guess there is no rush. 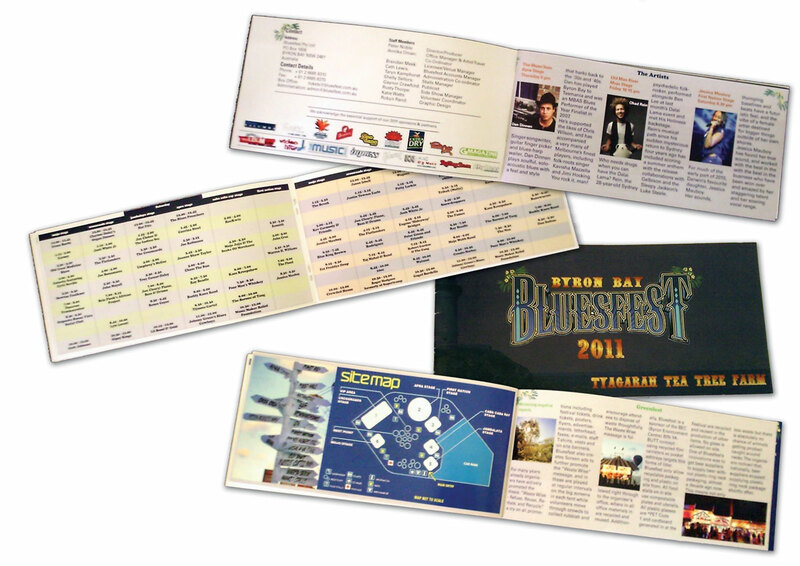 My plans are to begin with the most basic theme I can find, I decided this after looking at so many themes I was getting confused and frustrated at the fact that I couldn’t find a decent one that looked like a web page. The only suitable ones were the really expensive ones, then I realised that the whole purpose of me doing this was so I could learn how to create a WordPress web page myself. Maybe one day I will be the one creating themes for others, and damn it, I’ll make decent ones. There’s nothing worse then looking at a web page that looks like a cross between a blog & a my space page – instant retina ache material & there is so much of that out there. So it’s the Twenty Ten theme for me, I hope to have it up and running so you can see the changes I make as I make them. The host I want will have to be a WordPress friendly host, that is probably the most important bit to start with. I have a short list of other things I would like from my host, I think I’d be lucky to find one that does everything I want but I don’t think I’m asking too much really. Space: I am assuming I don’t need to much as I will not need to put anything fancy in, just a portfolio, contact details and a bit about me. I really think 5GB will be plenty, I could even find something around 3GB and that would keep me happy – I just don’t know if they give sell you that little at a time, if I eventually need more will I be able to upgrade. Bandwidth: I am guessing again here but I guess I will need a very small amount 10 – 20 GB will do – but here I will settle for near enough is good enough, I will be the only one adding to it, and I will only be updating it a few times a year, but then what if things change – I will want to be able to upgrade. Yep that’s me… always prepared! Cost: I don’t want to pay too much and I am particularly poor at the moment, so if I could pay by the month for one or two months then change to yearly it would be great. I expect to pay around $10 per month, or around $100 for a full year. Apparently WordPress needs PHP version 5 or greater as well as MySQL version 5 or greater (learnt something – that is the database system that WordPress uses to store my data on) these are upgrading all the time but I’m pretty sure that is the latest version at the moment. I would like a one click installation as the whole manual install thing sounds a bit much when there are quick & easy options. All the more to go wrong if you ask me. I would also like to make my permalinks easy to remember and understand so if I can find someone that gives me access to the .htaccess file it would make me happy. Somebody told me that ‘Apache’ has a mod-rewrite module which makes adjusting the permalinks simple. I also expect to have FTP available as a part of the package, which I’m pretty sure everybody offers anyway… don’t they. From that list and a whole lot of Googling I have a short list, which I wont publish here just in-case I get into some sort of trouble from someone. But they meet some of the things I wanted and 3 of them are Australian, which made me happy. I still have a bit more research before I find out half the things in my list, I may even have to contact them – which I hate doing but the information just doesn’t seem to be there. If you have any suggestions, recommendations or helpful (or humorous) comments it will be fantastic to see them. The first thing I did, (which may seem basic but it took a bit to figure out that I had to do this) was to go to wordpress.org . That’s where I read that, even though I was doing it through WordPress I had to find myself a web host (honestly thought they did this for me). They make it easy & actually give a link that takes you to some of the “best & brightest” well the first one I clicked on had a few bad reviews but luckily they also give a link to those – no excuses for not doing research really. Then I got impatient & decided there was really no need to get myself a host before I have a bit more idea of what I’m doing. So I downloaded the software – yep, the irresistible big blue button that invites us to download. Reading a few different bits & pieces from others I found that I will be working with the self hosted version of WordPress which is what I am downloading (in just 5 minutes!) It has a CMS which I will be able to fully customise, which can not be done with WordPress.com (although I noticed it is now only $17 + $8 + whatever else they lump you with, for a year). I am now getting a bit more excited about it all as I have found out that using the CMS I can include practically anything in my website. That’s right, things like e-commerce, forms, portfolio display, discussion forum, even a social forum. I can also interact directly with social media just with a plug-in. I was hoping to learn the e-commerce bit when I did the web design course but it was said to be to difficult at the time so I have been a bit let down by that for a while. Also true to WordPress style there are more themes than I can poke a stick at available at the click of a mouse, very similar to WordPress.com by the sounds of it. I hope to eventually design my own theme so I’m not too concerned about that at the moment. 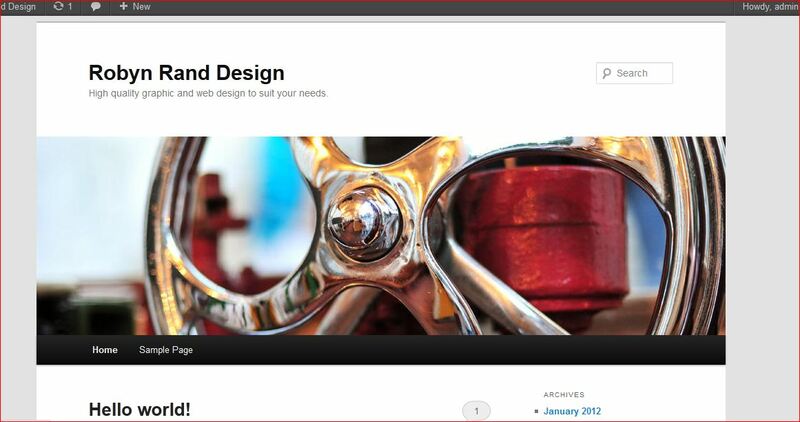 I have been thinking about making myself a website in WordPress – it certainly seems to be popular if you research it. The course I took last year (which I got a distinction in) was going to teach us how to do this but due to a class vote it was voted out and we only learned how to work with Dreamweaver, which was nice. If you are working on the same sort of thing & notice this please leave feedback as I have a feeling I will need all the assistance I can muster.